Until about 2 or 3 years ago, the pits which had stored "Little Boy" and "Fat Man" were all covered in with dirt and abandoned. Then as a part of a long overdue restoration project, they were excavated and covered with protective canopies. In case you can't read the plaque: "NO. 1 BOMB LOADING PIT. ATOMIC BOMB LOADING PIT. 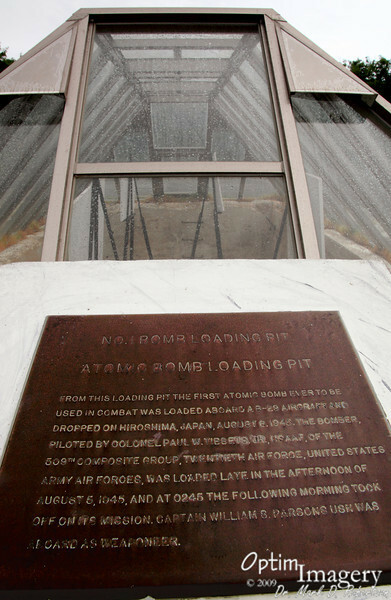 FROM THIS LOADING PIT THE FIRST ATOMIC BOMB EVER TO BE USED IN COMBAT WAS LOADED ABOARD A B-29 AIRCRAFT AND DROPPED ON HIROSHIMA, JAPAN, AUGUST 6, 1945. THE BOMBER, PILOTED BY COLONEL PAUL W. TIBBETTS, USAAF, OF THE 509TH COMPOSITE GROUP, TWENTIETH AIR FORCE, UNITED STATES ARMY AIR FORCES, WAS LOADED LATE IN THE AFTERNOON OF AUGUST 5, 1945, AND AT 0245 THE FOLLOWING MORNING TOOK OFF ON ITS MISSION. CAPTAIN WILLIAM S. PARSONS, USN, WAS ON BOARD AS WEAPONEER." The identical pit for "Fat Man" is just across the parking area.